I haven’t always approached my sewing the same way. In fact, even as I write that sentence, it occurs to me that I WON’T always approach my sewing the same way, and I feel very soothed by that idea. At the moment, I’m spending a lot of time thinking about and stewing over ideas before allowing them to hatch. I haven’t always sewed that way. Much of the time, as I began sewing, I would hold on to a pattern and pair it with a fabric for months before finally committing. I’m not sure that counted as planning so much as it was procrastination: fear that it wasn’t the right partnership of fabric and shape would freeze me up and I would be paralyzed, unable to make that all-important first cut. Gradually, I’ve become comfortable with the idea of experimentation, and have been more able to have an idea and jump in, no questions asked, no hesitation, and simply cut and stitch and attempt and test and verify and, many times, fail. It was exhilarating to try a new technique or a half-baked idea and just see where it took me. I learned A LOT by failing, too, I can tell you, especially about how to sew and make it not look like a failure, even when you were working with the very last little bittiest bit of fabric and you had to fake your way through because you couldn’t get any more. The past months, though, I’ve learned what a different type of exhilaration comes from visualizing an idea, working it out in your head or on paper, making changes, editing, altering, scrapping altogether only to resurrect, and then making it come to life. The logo wall hanging is totally an example of that: I have gotten such an intense level of satisfaction out of seeing this vision come alive that I almost don’t want it to end. Are there, maybe, sewing personality types? I don’t think I’m really the only one who goes through these phases, not really. Are there, out there, Procrastinators and Experimenters and Planners and Overthinkers (they’re the ones who love a project so much that they DON’T stop when they don’t want it to stop, and then it ends up being a little too much…)? 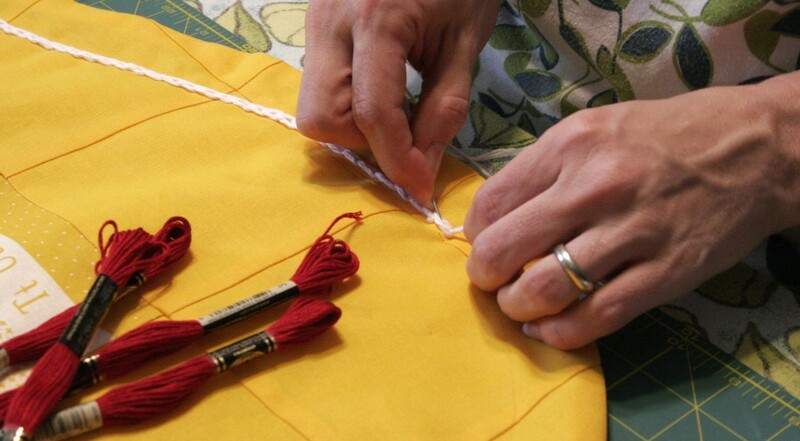 Are all of you out there, pursuing sewing with your own over-arching sewing worldview? I’m thinking that there is another personality out there waiting to grab me. Maybe it’s a mixture of all these others, or maybe they all take turns and will lead to some kind of symbiotic sum-of-parts thing. That’s what keeps me coming back, time after time: even when I think that I will tire of sewing, even when I’m sure that there isn’t anything new it can teach me about me, I am reminded that sewing has always been my best form of therapy, my favorite way to become more self-aware, and the most soothing addiction I can think of having. And that’s reason enough to keep planning and dreaming and doing, wouldn’t you agree? ← Embroidered Appliqued Quilted Logo Wall Hanging. Oh, Yeah.